The aim of this workshop is to bring together cognitive scientists, neuroscientists and computer scientists working on sound and music, as well as researchers from related fields. New insights on the cognitive and neural underpinnings of speech, music and sound processing will be presented, with a large focus on EEG and MEG data analysis. We anticipate this workshop to be a great opportunity for researchers to get a deeper understanding of available research methods and to foster multidisciplinary collaborations. Registration, the poster session and lunch/coffee will take place in Dawson Hall / the Shield Cafe (no. 4 in the campus map). The venue is easily accessible by public transport. 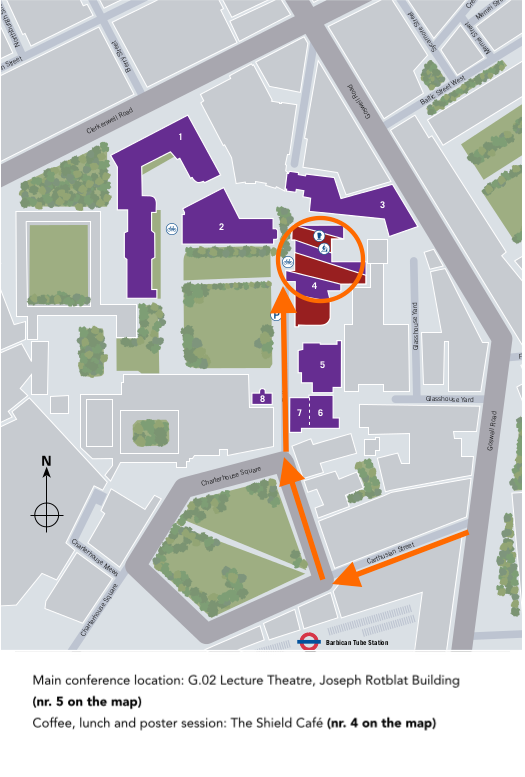 It is within 2 minutes walk of Barbican Underground station (Circle, Metropolitan, and Hammersmith & City lines). The Workshop on Auditory Neuroscience, Cognition and Modelling is supported by the Centre for Digital Music through its EPSRC Platform Grant and by a Royal Academy of Engineering Research Fellowship (RF/128).